With an AR-15 and nine other guns on her left, Sen. Dianne Feinstein, D-Calif., introduced a bill today that would ban assault weapons and high capacity ammunition clips. The bill comes nearly 20 years after the first assault weapons ban was signed into law. "I remain horrified by the massacre committed at Sandy Hook Elementary School in Newtown, Conn., and I'm also incensed that our weak gun laws allow these mass killings to be carried out again and again and again," said Feinstein, who was joined by senators, representatives, mayors, police officials and victims of gun violence. "Military-style assault weapons have but one purpose, and in my view that's a military purpose, to hold at the hip, possibly, to spray fire to be able to kill large numbers." "Assault weapons were designed for and should be used on our battlefields, not on our streets," Sen. Charles Schumer, D-N.Y., said. "We know that there is no inalienable right to own and operate 100-round clips on AR-15 assault rifles." Feinstein's proposed plan, which she will formally introduce on the Senate floor this afternoon, will ban the sale, transfer, manufacturing and importation of 158 semi-automatic weapons with at least one military feature. It would also ban fixed magazines that are capable of holding more than 10 rounds. The newly bill differs from the 1994 assault weapons ban in that it does not have a sunset provision. Feinstein said the bill will protect over 2,200 makes of hunting and sporting rifles and shotguns, and the bill will subject existing or grandfathered weapons to background checks if they are sold or transferred. "We have tried to learn from the bill. We have tried to recognize legal hunting rights. We have tried to recognize legal defense rights. We have tried to recognize the right of a citizen to legally possess a weapon. No weapon is taken from anyone. The purpose is to dry up the supply of these weapons over time. Therefore, there is no sunset on this bill," Feinstein said. Feinstein acknowledged the difficulty lawmakers face in passing this bill through Congress. "Getting this bill signed into law will be an uphill battle, and I recognize that, but it's a battle worth having," Feinstein said. "We must balance the desire of a few to own military-style assault weapons with the growing threat to lives across America." The National Rifle Association said Feinstein's plan infringes on second amendment rights and neglects to address other issues spurring gun violence. 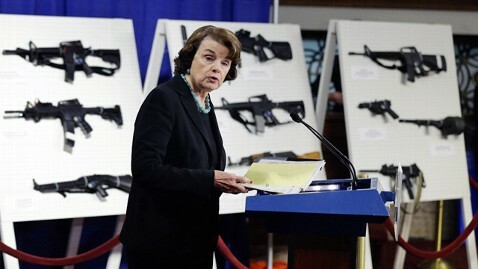 "Senator Feinstein has been trying to ban guns from law-abiding citizens for decades. It's disappointing but not surprising that she is once again focused on curtailing the Constitution instead of prosecuting criminals or fixing our broken mental health system. The American people know gun bans do not work and we are confident Congress will reject Senator Feinstein's wrong-headed approach," Andrew Arulanandam, spokesman for the NRA, told ABC News. Feinstein's office told ABC News that the senator worked with U.S. Capitol Police and Washington Metro Police to ensure the display of weapons at the press conference complied with the rules. An ABC News-Washington Post poll released last week found that 65 percent of those polled supported banning high capacity ammunition magazines while 58 percent favored banning the sale of so-called assault weapons. Last week, President Obama introduced his gun policy agenda, which called for the banning of some assault-style weapons and high capacity magazines holding over ten rounds. The president's plan included 23 executive actions on gun violence that would not require congressional approval, which included a directive for national agencies to strengthen the criminal background check system. A new ABC News-Washington Post poll out today showed 53 percent find the president's gun control plan to be favorable while 41 percent view it unfavorably.